Posted December 1st, 2018 - News Posted for China News, World Surfing News. To view race results, schedule and heats, click here. 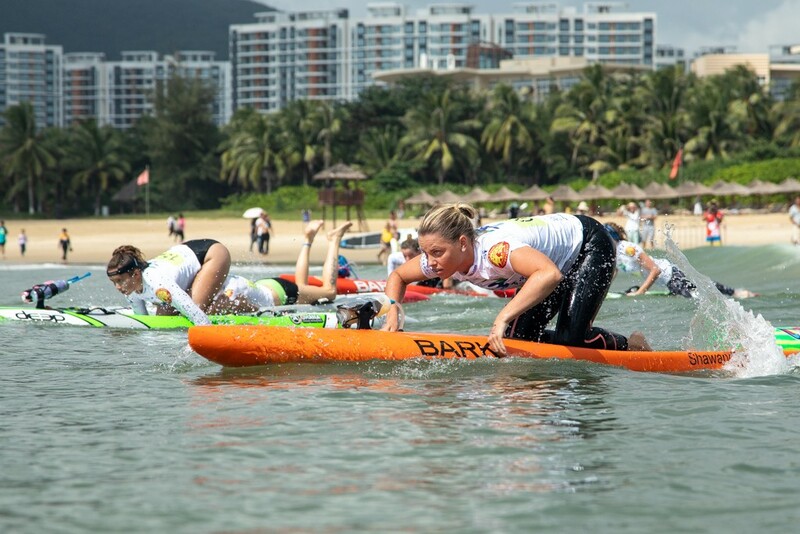 Team Australia has catapulted into the lead with two Gold Medal performances in the 18 km SUP and Paddleboard Distance Races at the 2018 ISA World SUP Paddleboard Championship in Wanning, China. 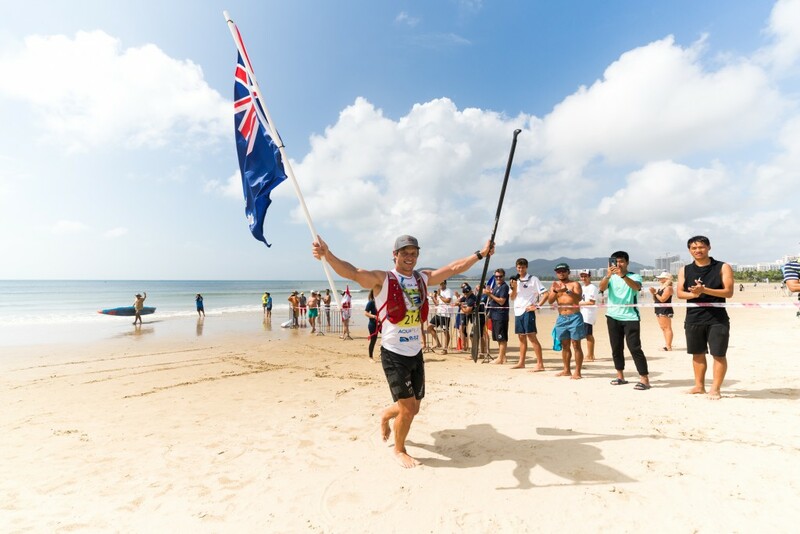 Michael Booth earned his second ISA Distance Gold for Australia in the Men’s SUP race and Grace Rosato swept the 2018 Paddleboard categories with Gold in the Women’s Division. The two Aussie Golds coupled with a Silver from Lachie Lansdown in the Men’s Paddleboard and a Silver and Bronze from Terrene Black and Shakira Westdorp respectively in the Women’s SUP boosted Team Australia into the overall team ranking lead ahead of Team USA. 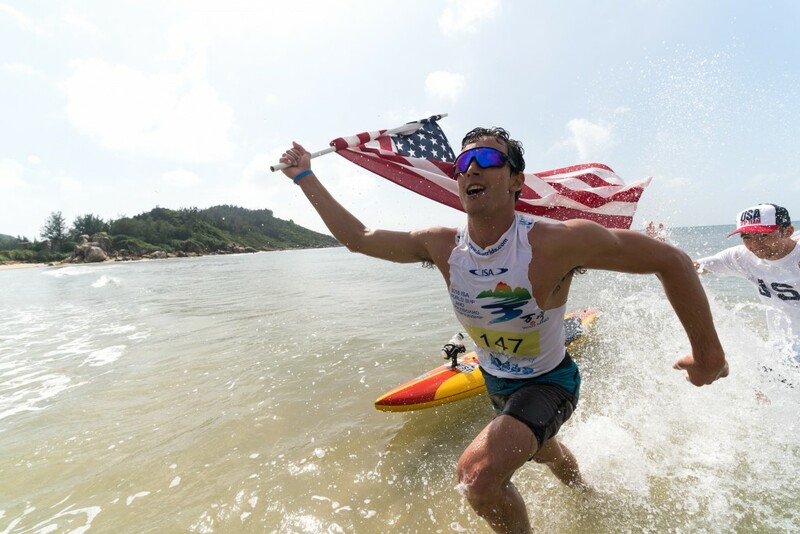 Team USA’s Hunter Pflueger earned a Gold Medal of his own in the Men’s Paddleboard along with a Bronze from Kailyn Winter to keep Team USA close and within reach on the Final day of competition. Team France moved up into Bronze position with Team Spain in Copper. With one day remaining, the Team Relay Race on Sunday will determine who wins the overall Team Gold. Australia will go for their sixth Gold Medal in the event’s history, while USA will attempt to get their second. The Men’s SUP and Paddleboard Distance Races kicked off the day of competition. Australia’s Booth, the 2016 Gold Medalist, and USA’s powerhouse Connor Baxter separated from the pack early in the SUP discipline. Booth eventually dropped Baxter, never taking his foot off the gas to build a commanding lead and finish ahead of the field to earn his second ISA Distance Gold. Hungary’s Daniel and Bruno Hasulyo along with Brazil’s Vinnicius Martins started a draft train to move into medal position, passing France’s Titouan Puyo and USA’s Baxter. 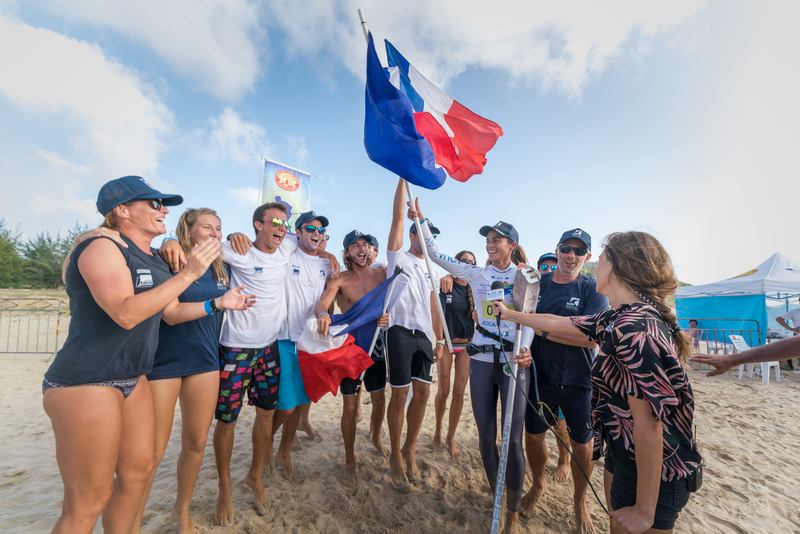 Bruno Hasulyo, the 2017 Gold Medalist, finished with the Silver, Martins with the Bronze and Daniel Hasulyo, who won the Men’s SUP Technical Race earlier in the week, with the Copper. “It feels great,” said Booth. “I had a poor showing last year, but to come back this year and win it means a lot. India’s Sekar Patchai put on an inspirational performance as the sole representative for Team India with a 18th place finish out of 40. The Men’s Paddleboard Distance Race, which took to the course shortly after the Men’s SUP, was closely fought until the last lap. A pack of the top five leaders stayed neck-and-neck, drafting off each other’s wake to conserve energy. On the final lap USA’s Pflueger broke the pack and sprinted ahead to the Gold Medal. “Losing to Lachie in the Technical Race this week really fueled my fire,” said Pflueger. The 2017 Gold Medalist, Lachie Lansdown, finished next with the Silver Medal. South Africa’s Jadon Wessels earned the Bronze and Spain’s David Buil the Copper. The Women’s SUP and Paddleboard Distance Races followed, equaling the excitement seen in the morning with the men. Olivia Piana got off to a blazing start in the SUP race and by the second lap had built an unsurmountable lead ahead of the competition. Piana, who has earned five ISA Silver Medals in her career, finally was able to break through and earn a Gold. Australia’s duo Black and Westdorp followed with Silver and Bronze, a strong result for Westdorp who also earned the SUP Surfing Gold, and Japan’s Yuka Sato earned Copper. The Women’s Paddleboard race was even closer than the Men’s with Australia’s Technical Race Gold Medalist Rosato trading off the lead with Spain’s Judit Verges and USA’s Kailyn Winter. Rosato managed to regain the lead and earn the Gold for Australia, a discipline that no other country has ever won. Verges earned the Silver for Team Spain, barely sprinting ahead of USA’s Winter who earned the Bronze. Denmark’s Katrine Zinck earned the Copper Medal. “I can’t put it into words,” said Rosato. “I am absolutely stoked that I am now a two-time World Champion. I can’t believe it. “We’ve arrived at the moment that we have all been waiting for. The team ranking will come down to the Relay Race, where teamwork and camaraderie are especially crucial.